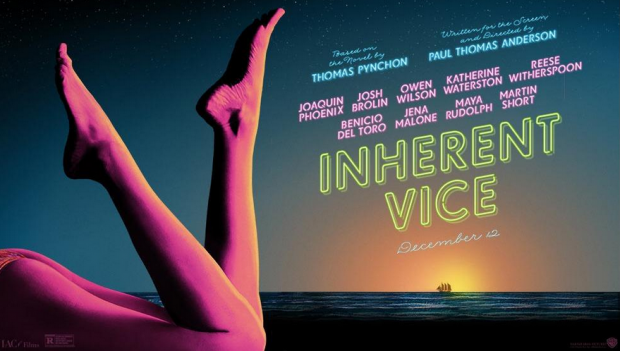 Yes, it is finally here: after many months of waiting, Warner Bros. have unveiled the first trailer for Paul Thomas Anderson‘s Inherent Vice., the writer-director’s seventh feature and the very first adaptation of a Thomas Pynchon novel. In case you haven’t been keeping tabs, Vice follows Larry “Doc” Sportello (Joaquin Phoenix), a pot-smoking detective on a kidnapping case in 1970’s Los Angeles, with the picture backed by an ensemble consisting of Reese Witherspoon, Owen Wilson, Benicio del Toro, Martin Short, Jena Malone, Josh Brolin, and many, many more. According to our first impressions, “Mix together The Big Lebowski and Altman‘s The Long Goodbye, turn it into a two-and-a-half hour PT Anderson epic and you’re getting close to the awesome experience of Inherent Vice.” As someone who’ll be seeing our most-anticipated film of the fall shortly at the New York Film Festival, I’ll be staying far away from this trailer, but those who wish to indulge should dive in below, along with two versions of the teaser poster, and return soon for our review. “Inherent Vice” is the seventh feature from Paul Thomas Anderson and the first film adaption of a Thomas Pynchon novel. When P.I. Doc Sportello’s ex-old lady shows up with a story about her current billionaire land developer boyfriend and a plot by his wife and her boyfriend to kidnap that billionaire and throw him in a looney bin… well, easy for her to say. It’s the tail end of the `60s, paranoia is running the day and Doc knows that “love” is one of those words going around, like “trip” or “groovy,” that’s way too overused–except this one usually leads to trouble. With a cast of characters that includes surfers, hustlers, dopers and rockers, a murderous loan shark, LAPD Detectives, a tenor sax player working undercover and a mysterious entity known as the Golden Fang, which may only be a tax dodge set up by some dentists… Part surf noir, part psychedelic romp–all Thomas Pynchon. 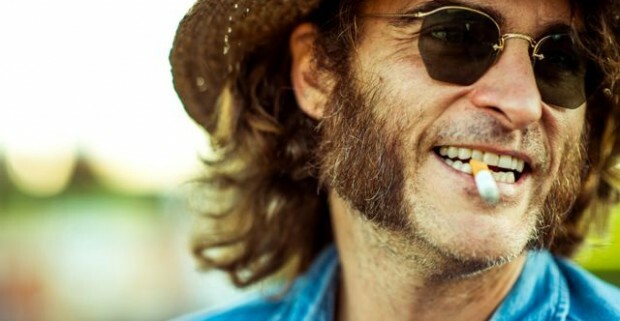 Inherent Vice enters limited release on December 12th before going wide in January. What impressions are gleaned from this first trailer?